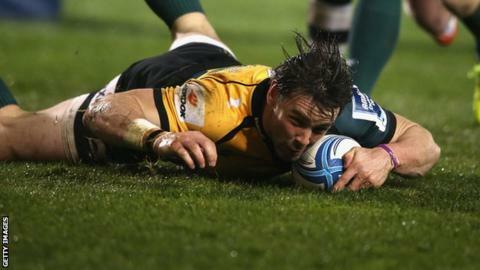 Northampton Saints flattened Sale Sharks to advance to the semi-finals of the Amlin Challenge Cup. Henry Thomas went over for an early Sale lead, but Saints replied with three tries from driving mauls - Ben Nutley twice and Sam Dickinson once. Ben Foden also crossed in a dominant first half for the visitors. Sharks could only muster a Viliami Fihaki try after the break as Saints progressed to face either Stade Francais or Harlequins. Ben Foden has won the Challenge Cup with both of these sides - firstly with Sale in 2005 and then with Saints in 2009. Sale had ended Northampton's 11-game winning run in the Premiership 12 days ago, contributing towards the worst spell of the campaign for Jim Mallinder's side, who had lost their last three in all competitions. But both teams gave a clue as to where their priorities lie this season, making 22 changes between them from their league games last weekend. And it seemed like Sale had adapted better to the reshuffle. Nick MacLeod kicked a penalty right into the corner and, after Kirill Kulemin coolly claimed the line-out, Will Cliff recycled and fed Thomas to cross, allowing MacLeod to take the extras. But the Saints reply was not only swift but also decisive, opting for a line-out with a penalty deep in Sharks territory, which gave Nutley the opportunity to spin off the subsequent maul for a try that Will Hooley converted. And again the 2009 champions were rewarded for their adventure, turning down the three points from the boot and once more taking the catch and drive, this time with Dickinson at the centre and touching down. Hooley made it two from two off the tee and moments later was converting another after creating Saints' third, side-footing through a grubber kick that Foden, who has won the Challenge Cup with both of these clubs, finished off. Sale, already looking overwhelmed, were soon down to 14 men temporarily as Thomas saw yellow for a misdemeanour in the scrum. And Northampton returned to the tried and tested formula that bore fruit in their first two tries, penetrating the home defence with the driving maul to give Nutley his second and Hooley another conversion on the stroke of half-time. Sale managed to subdue their opponents' power after the break, but rarely looked like threatening themselves against a Northampton team content with the damage they inflicted in the opening period. Their one breakthrough came in the same manner in which they had been undone so many times throughout the night, with Fihaki touching down from a catch and drive, and Joe Ford collecting the extras. The biggest concern for Mallinder will have been the sight of Dom Waldouck being taken off on a stretcher six minutes after coming on, but the Saints boss can otherwise be satisfied with a professional performance from his young team. "It's been a good group, we had a lot of success over the LV= Cup and Six Nations period. To get through to another semi-final at home is good. "We learnt the lessons from our league match here a couple of weeks ago. It was a clinical first-half performance and we knew when to hold out in the second period. "It'd be nice to play Stade Francais, but it's out of our hands and we'll look forward to the match, whoever we end up facing." Sale Sharks: Arscott; Brady, Forsyth, Jennings, Miller; Macleod, Cliff; Harrison, Taylor, Thomas; Ostrikov, Kulemin; Gaskell (capt), Easter, Fihaki. Replacements: Fowles for Cliff (52), Mackenzie for Brady (55), Buckley for Thomas (61), Ford for MacLeod (61), Croall for Harrison (68), Jones, Mills, Paterson. Northampton Saints: Foden; K. Pisi, Wilson, Stephenson, Autagavaia; Hooley, Dickson; Waller, McMillan, Mercey; Dickinson, Craig; Dowson (capt), Nutley, Van Velze. Replacements: Denman for Mercey (43), Waldouck for Stephenson (43), Elliott for Waldouck (49), Harrison for Nutley (58), Williams for McMillan (64), Hobbs-Awoyemi for Waller (64), Fotuali'i for Wilson (72), Day .